If you happen to see a swarm of butterflies flying above the terrace of your office in the crowded Bengaluru city, count yourself lucky. You are witness to the largest annual butterfly migration in southern India. Every year between October and December, swarms of Dark Blue Tiger and Double Branded Brown Crow fly through the Bengaluru-Mysore area to their summer homes in the evergreen forests of Sahyadri in the Western Ghats. There they crowd in dense congregation for weeks, court and breed. The Western Ghats, along with the Himalayas, the country’s north-east region and the Andaman Islands, are home to butterflies unique to India. With 1,800 known species and subspecies, the country boasts an impressive 10 per cent of the global biodiversity in butterfly. Butterflies are crucial pollinators and their contribution to global agriculture is valued only next to honey bees. A fall in their population would also lead to a fall in their predator population like the wasps, spiders and birds. According to Krushnamegh Kunte, India’s leading lepidopterist and a post-doctoral fellow at Harvard, habitat destruction and deterioration are the foremost threats to butterfly population. “In India, widespread and excessive use of pesticides and herbicides has exacerbated the problem,” he says. Several intended or unintended human interferences, such as agriculture, fires and dams, alter forest structure and plant composition, or completely destroy butterfly habitats. This has had the most serious impacts in the eastern Himalayas and northeastern India, where butterfly habitats are vanishing at an alarming rate. Add to this the thriving illegal trade in butterflies. High altitude species like Kaisar-I-Hind, Bhutan glory, Pale Zezebel and Ladakh Banded Apollo can fetch up to Rs 20,000 in the international market. 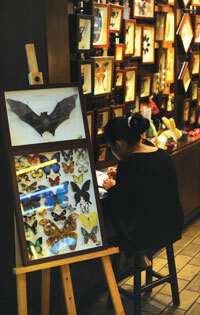 They are used by collectors to adorn greetings cards, paperweights and jewellery. One can also buy rare species over the Internet. A visit to www.insectdesigns.com can be chilling. Taking advantage of the fact that in most countries other than India, trade in butterflies is legal, the site makes available different varieties priced between US $2 and $330. In India, several cases were reported in the last decade where researchers and tourists from abroad were caught with huge consignments of dead insects, including butterflies. In 2008, for instance, two Czech nationals were caught with 2,000 specimens of larvae and insects collected from the Singalia National Park in north Bengal. The biodiversity hot spots of eastern Himalayas and the Western Ghats are the prime hunting grounds. If you are more ambitious and hardworking, and have some space, you could develop an exclusive butterfly garden, much like what Jyoti and Yashodan Heblekar have done in Goa or Arjan Basu Roy has done in West Bengal. 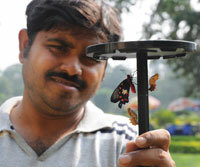 In the 25-hectare urban forest of Banabitan at Salt Lake in Kolkata’s eastern fringes, an avid wildlife enthusiast started work on a butterfly park in 2009. That year Roy visited the Itami butterfly garden in Japan and was motivated to start something similar in Kolkata. After a formal approval from the forest department he started work right away. The concept of this park, though, is a tad different from that in the rest of the world. Butterfly gardens are usually enclosed spaces—a netted dome of sorts—with artificially maintained temperature, light and humidity. The disadvantage of such a garden is lack of indigenous species diversity. Despite being a heavily polluted city, Kolkata has almost 150 species of butterflies. This made Roy opt for an open-air garden. The first step was to understand the various species and develop a suitable habitat. “The imperative of a habitat,” says Roy, “is that it must have all the prerequisites for survival of the species. Unless they are satisfied with the food, plants, sheds and water, it is difficult to keep butterflies in a place. Each species has its own taste and preference”. He did a survey to check the species diversity. Of the 80 or so species, he zeroed in on 22 large ones that were colourful and visible from a distance. “The crucial part came then: we went about studying each of these species, what they prefer as nectar, where they like to stay and lay eggs,” he says. A butterfly needs two types of plants. Nectar plants for adults, and larval host plants for caterpillars. The growth of a butterfly depends entirely on the larval stage: if the larva is well fed, the size of the adult will be bigger. As such, female butterflies are picky on which leaves to lay eggs on. Some, for instance, would want their offspring caterpillars to be fed only on lime leaves. Each species has a distinct palate for nectar. In Banabitan, trees were selected and planted keeping in mind these tastes and preferences. Inside the butterfly park is a puddle. A muddy wet patch littered with gravel, and salt added externally. Just before mating the adult males smear themselves in salty mud—a behaviour known as mud puddling. The collected sodium and amino acids are then transferred to the females during mating as a nuptial gift. Jyoti and Yashodan Heblekar, proud owners of a butterfly park in Goa call the mud puddle “a butterfly café—a royal treat where butterflies of various kinds find solace and salt”. It is a gathering for tired wings and thirsty probes— where the male clan gather and exchange notes on failed matings and broken thoraxes, they say. @anonymous: you may join the butterflyIndia yahoo group to share content and initiate/participate in discussions. Super story. I know nothing about butterflies but this writeup has got me started. I have not heard of the Annual Butterfly Migration which happens in southern India and it is lucky to see that. I have heard about birds migrating from one place to another. Anyways it was very interesting to read the post. Thanks for sharing this.